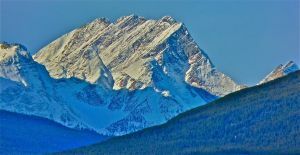 This peak is #55 in Prominence List for Alberta .Located on the continental divide between the Grant River Valley and Miette River Valley. It can be seen from Highway 16 at the Clarivaux Creek Bridge. Name Notes: The name was official in 1926, taken from Simon Fraser who named the area between the Rocky Mountains and the Coast Range New Caledonia because the land was similar to his mother's descriptions of her native Scotland.